The road to Agra takes a new turn. I have never been one to complain about the condition of Indian roads. I learned to ride motorcycles on sand. The man who taught me how to drive gave me the second most important lesson of driving: when you see a pothole, or obstacles like moving cars, people and animals, wait for them to move out or drive around them (the first was: do not hurt or kill anybody). The first time I drove in the West, I was bored; once you had done extreme speeds and jubilated about not getting caught by radar or camera, there was the prospect of monstrous monotony. The supreme joy of pressing the accelerator—with the occasional twitch of the steering wheel—on carpet-like roads rolling on and on seemed, er, utilitarian. I have friends who wax eloquent about screaming along at 150kmph on the expressways of New India. I hand over the wheel to them when I find myself on these infrastructural marvels. 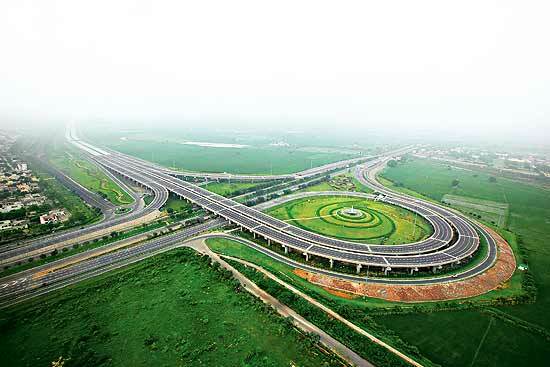 Naturally, I was in the passenger seat as we entered the 165-km-long Yamuna Expressway from Greater Noida to Agra. At the exit to the Expressway stood a hitchhiker in cool shades, a Jansport knapsack and sneakers that explained instantly why the rupee is depreciating. In no time, we were overtaken by a marauding Mahindra Scorpio from the left. I breathed a sigh of relief: maybe this was not going to be a ride into inanity. Indian roads may betray my expectations of excitement, but it will take Jaypee several years of social engineering to to re-engineer the average Indian driver, that product of unnatural selection. The surface is cement concrete, which is long-lasting but doesn’t help the tyres last long—asphalt is generally believed to be kinder on rubber. Besides, the noise that rubber makes on a cemented surface is manic; it approximates a pressure cooker on a stove, when you don’t have the option of turning down the flame. I’ve heard that menacing noise before when a Cadillac truck overtook me somewhere in the western hemisphere. My head was under a strapped-up, open-ear helmet as I rode a motorcycle at 200kmph. All I remember is the sound; it messes with your brain, making it imagine sound variations when something comes between the rubber and the cement. Something like…oh, well, forget it. The drive is comfortable. I push back the seat, put my feet up on the dashboard, and try to get accustomed to the sound of rubber-on-cement underneath. I want to listen to some classical music, but have forgotten to carry the CDs. It does not seem a very unfair deal to exchange relaxation for the not-too-subtle pleasures of an obstacle course. There are no sudden movements. If there is a recording of Sri Sri Ravishankar’s observations on meditation, this would be the place to play it. I prefer light conversation. We go past the Buddh International F-1 Circuit, named for irony, and decide we need a coffee stop, preferably with something to eat. There is a restroom after every toll plaza, but there is nothing to eat that doesn’t come in a packet. We notice a gap in the wire-mesh perimeter, and the promise of a dhaba: Shri Krishna Kripa Bhog Restaurant, it announces. There are hot paranthas doused with butter. Soon, we are back on the road. Just the vista is worth the Rs 510 we pay at the toll for the 330km round trip. The clouds are obliging, the rain patchy. The air-conditioning fixes the only glitch in the elements, the humidity. The road signs tell us we are under observation, in case we exceed the speed limit of 100kmph. But it’s the warning about neelgai straying on to the road that has me in splits: I’m being made to feel like I’m in America. But unlike America, stray dogs do get on to the expressway. With the cars speeding, their carcasses are distributed over a longer stretch. Further up, we encounter a bunch of villagers blocking the path of India’s economic growth with assorted boulders. They let us pass, but we pull over and I get off to answer the calling of investigative journalism. They are upset because the underpasses built to connect their villages are submerged, making it impossible to cross the expressway except to jump over the road restraints and take their chances with the automobile rush. We leave behind the faultline of development and press on, for it does not look like we will make it to the Taj Mahal before the ticket window shuts at 6pm. We get off the expressway and enquire; a policeman says there is a ‘riks’, and that we should hurry up. It is this congested stretch through Agra that explains why we make such a big deal of expressways. We barely make it in time to see what the tourists come to see—the reason for this expressway. We devour the Taj with our camera and Sahir Ludhianvi’s famous poem and take the route back. I’m driving now and am looking for a fuel station, for there is none on the expressway. There are no road signs for the expressway, only for NH-2. So we get lost and have dinner instead. Eventually, I find my way back and it is 9.06pm by the time we exit on to the expressway. We are terribly late, and I decide to take my chances with the speed camera. Eighty minutes later, we have run out of the expressway. No signals, no stops. With plenty of time in the car to relax, or do as you please. This is a new path, a new narrative, connecting very old themes.